Gross domestic product (GDP) is the market value of all final goods and services from a nation in a given year. Countries in Oceania are sorted by nominal GDP estimates based on 2017 data from The World Factbook by the Central Intelligence Agency. 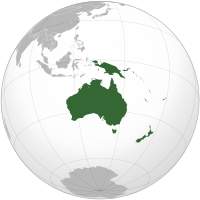 Below is a list of all the Oceanian countries, in order of geographical area. Oceania's total geographical area is 8,525,989 km². This is a list of articles holding galleries of maps of present-day countries and dependencies. The list includes all countries listed in the List of countries, the French overseas departments, the Spanish and Portuguese overseas regions and inhabited overseas dependencies. See List of extinct countries, empires, etc. and Former countries in Europe after 1815 for articles about countries that are no longer in existence. See List of countries for other articles and lists on countries. A World Heritage Site is a location that is listed by UNESCO as having outstanding cultural or natural value to the common heritage of humanity. The World Heritage Committee has designated 32 World Heritage Sites in Oceania. These are in 11 countries, with the majority of sites being located in Australia. 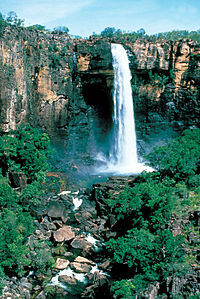 The first three inscriptions from the region, the Great Barrier Reef, Kakadu National Park and the Willandra Lakes, were in 1981—three years after the list's creation. The region contains the world's three largest sites: Phoenix Islands Protected Area, Papahānaumokuākea and the Great Barrier Reef. In addition, the Tasmanian Wilderness is one of only two sites that meet seven out of the ten criteria for World Heritage listing (Mount Tai in China being the other). A woman from Tahiti, French Polynesia, circa 1906. Women have been a vital part of history and culture in the geographic area known as Oceania today. Women in Oceania have diverse cultural identities which relate to the geography of the continent and the social structures of the people living there. 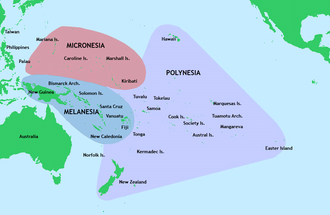 Their evolution, culture and history coincide with the history of Oceania itself. ... that the Rollers won the 2017 Asia-Oceania Wheelchair Basketball Championships, while the Gliders came in second? For editor resources and to collaborate with other editors on improving Wikipedia's Oceania-related articles, see WikiProject Oceania.